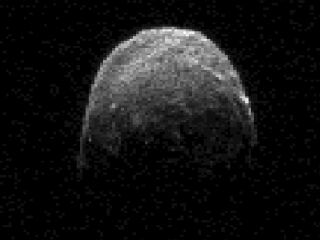 NASA has captured a new radar image of 2005 YU55, the huge asteroid due to make a close approach to Earth tomorrow (Nov. 8). The agency's Deep Space Network antenna in Goldstone, Calif. snapped the image at 2:45 p.m. EST (1945 GMT) today (Nov. 7), when the aircraft-carrier-size 2005 YU55 was about 860,000 miles (1.38 million kilometers) from Earth, NASA officials said. 2005 YU55, which is 1,300 feet (400 meters) wide, will get quite a bit closer still. It will come within about 201,700 miles (324,600 km) of our planet at 6:28 p.m. EST (2328 GMT) tomorrow — closer than the moon, which orbits 238,864 miles (384,499 km) from us on average. The space rock's close approach is exciting for scientists, who are taking advantage of the chance to get a relatively up-close look at 2005 YU55. Researchers around the world have trained a number of instruments on the asteroid and will watch it until it recedes into deep space once again. The 230-foot (70-m) Goldstone antenna, for example, has been tracking 2005 YU55 since Nov. 4 and will continue to do so until Nov. 10, researchers said. And scientists will begin following the asteroid with the even larger Arecibo Planetary Radar Facility in Puerto Rico tomorrow. Astronomers already have a pretty good idea of 2005 YU55's orbit and size. But the observations made during this flyby will help them refine their understanding of the space rock and its movements. They should be able to extend their predictions of the asteroid's precise trajectory out another century or two, researchers have said. 2005 YU55 will continue to swing by our planet fairly frequently; it completes one lap around the sun every 15 months. But this year's flyby marks the closest it has come to our planet for at least the last 200 years, researchers said. While astronomers using huge radio telescopes will get the best looks at 2005 YU55, ordinary backyard skywatchers under clear, dark skies can see it, too, as long as they have access to a decent telescope. Any scope with an aperture 6 inches (15 centimeters) or greater should do the trick on the night of Nov. 8, researchers have said. The tough part will be knowing where to look, since 2005 YU55 will be cruising swiftly through the sky. But help is out there: The asteroid's coordinates at any given time can be looked up at the Solar System Dynamics website run by NASA's Jet Propulsion Laboratory in Pasadena, Calif. Here's the link: http://ssd.jpl.nasa.gov/. Note: If you snap a photo of asteroid 2005 YU55 during its Nov. 8 flyby of Earth and would like to share it with SPACE.com for a possible story or gallery, send the image and your observing comments to SPACE.com senior writer Mike Wall at mwall@space.com.